CONCORD, N.C. — Kevin Harvick scored the fastest lap time in Round 3 of qualifying in his No. 4 Stewart-Haas Racing Ford at Charlotte Motor Speedway Thursday with a speed of 193.424 mph, winning his first pole for the Coca-Cola 600. It’s his third Coors Light Pole this season and the 20th of his career. 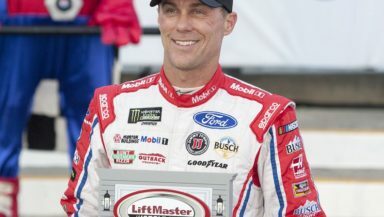 Harvick also has two previous victories in the event in 2011 and 2013 and is one of three active Cup Series drivers who have multiple Coca-Cola 600 wins (Jimmie Johnson has three, Kasey Kahne has four). Kyle Busch, winner of last week’s All-Star race, will join him on the front row, posting the second-fastest lap at 192.513 mph in his No. 18 Joe Gibbs Racing Toyota. If he can capture the checkered flag this Sunday, he would become the eighth driver who has won the All-Star race and followed it up with a win the following week in the Coca-Cola 600. Chase Elliott will start third in his No. 24 Hendrick Motorsports Chevrolet after a qualifying lap of 192.260, with Joe Gibbs Racing’s Matt Kenseth in fourth (192.130). Erik Jones rounds out the top five in his Furniture Row Racing Toyota (191.782). Kyle Larson, the series points leader, and Corey LaJoie missed the first round of qualifying when they were unable to pass inspection before the round ended. Larson will start 39th in his Chip Ganassi Chevrolet and LaJoie will start 40th in his No. 83 Toyota. Larson, while disappointed, isn’t overly concerned. The Coca-Cola 600 will be broadcast Sunday, May 28, at 6 p.m. on FOX.